Will Hondo and Deacon remain on the job? Is the SWAT TV show cancelled or renewed for a third season on CBS? The television vulture is watching all the latest TV cancellation and renewal news, so this page is the place to track the status of SWAT, season three. Bookmark it, or subscribe for the latest updates. Remember, the television vulture is watching your shows. Are you? 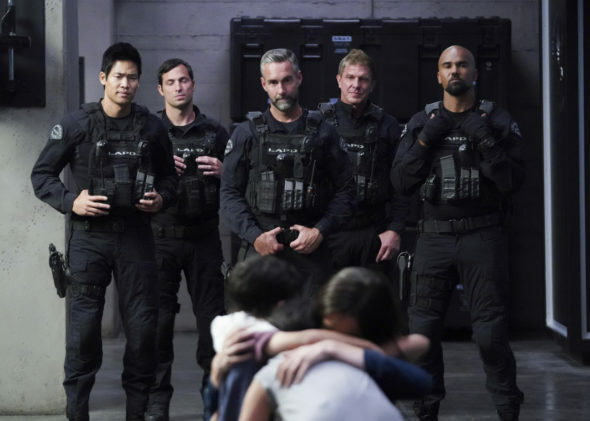 A CBS action-adventure drama, SWAT stars Shemar Moore, Stephanie Sigman, Alex Russell, Jay Harrington, Lina Esco, Peter Onorati, David Lim, and Patrick St. Esprit. The crime thriller centers on Sergeant Daniel “Hondo” Harrelson (Moore). A lifetime Los Angeles local and former Marine, Hondo has been tapped to lead a new “last stop” Special Weapons and Tactics unit. Thanks to his background, he is uniquely qualified to lead the team in a manner that also builds a bridge to the community he holds so dear. Hondo’s group includes the seasoned David “Deacon” Kay (Harrington), newcomer Jim Street (Russell), and canine trainer Christina “Chris” Alonso (Esco). They work under the supervision of L.A. Metro Captain Jessica Cortez (Sigman), a dedicated professional who also has a personal connection to Hondo. Meanwhile, Mumford (Onorati) leads a rival unit. The second season of SWAT is averaging a 0.79 rating in the 18-49 demographic and 5.34 million viewers. Compared to season one, it is down by 16% and 9%, respectively. Find out how SWAT stacks up against the other CBS TV shows. As of April 19, 2019, SWAT has not been cancelled or renewed for a third season. Stay tuned for further updates. Will CBS cancel or renew SWAT for season three? The ratings aren’t great but they’ve been pretty consistent. CBS needs newer dramas to help fill their schedule so I think it will be renewed. I’ll keep an eye on the Nielsens and update this page with breaking developments. Subscribe for free updates on any SWAT cancellation or renewal news. TV show ratings are still important. Follow SWAT‘s weekly ups and downs. Find more SWAT TV series news or other CBS TV show news. What do you think? Should the SWAT TV series be cancelled or renewed for season three on CBS? Were you surprised it came back for a second season? It’s a great show! Definitely renew for season 3. Characters are diverse and interesting back stories!!!! Renew!